Hello everyone! 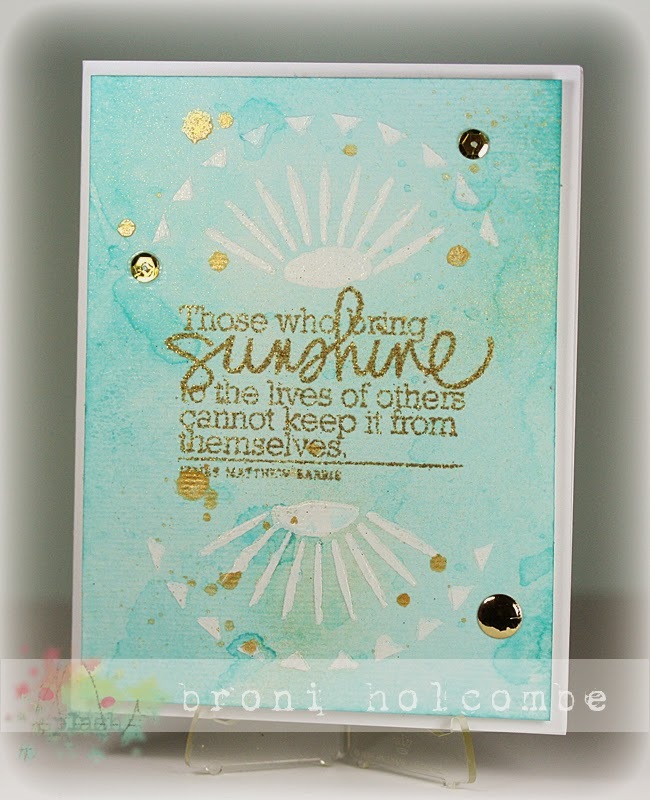 It's Broni here and I wanted to share with you today how I made my Golden Sunshine card using the Gesso resist technique, with water-coloring. 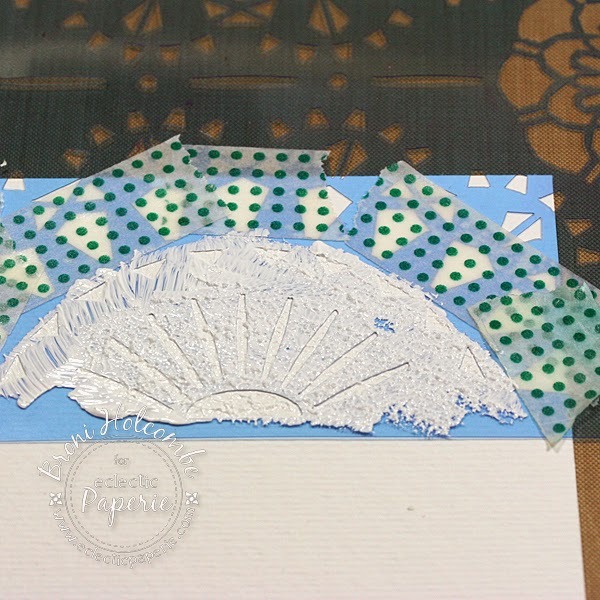 I started by taping my doily stencil to the top of a piece of watercolor paper. I applied Gesso using a foam brush, let it dry, then applied another layer. I also flipped the piece of watercolor paper around and did it at the opposite end. 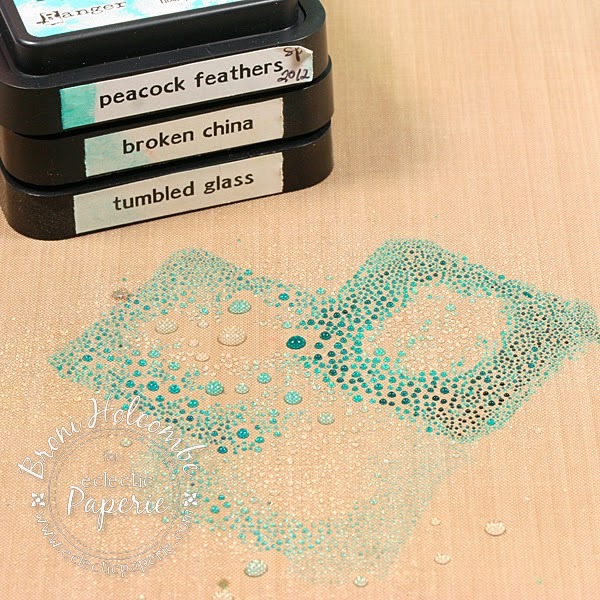 Next I smooshed (technical term) 3 colors of Distress inks onto my craft sheet - Peacock Feathers, Tumbled Glass, and Broken China. I spritzed it with a lot of water then, when the Gesso was completely dry, I turned my watercolor paper face down into the ink. 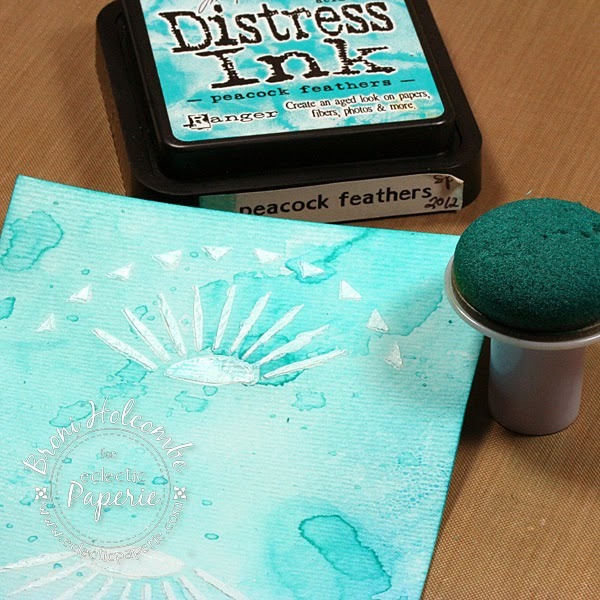 I picked it up and dried it with my heat tool to keep the cool ink patterns. I inked around the edges of the paper with some Peacock Feathers ink. Next I spritzed it thoroughly with water. 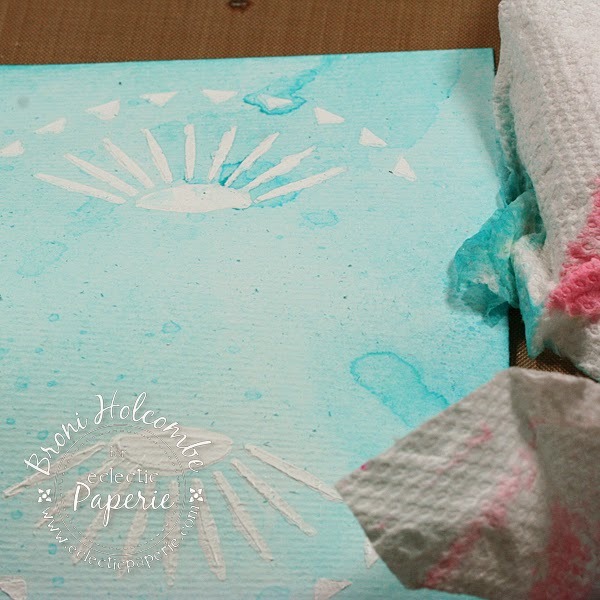 I wiped it with a paper towel to give it a softer look and to remove the ink from the Gesso. Then I stamped the sentiment in gold and also embossed it in gold. I spritzed and dripped on some gold ink and added some gold bling. 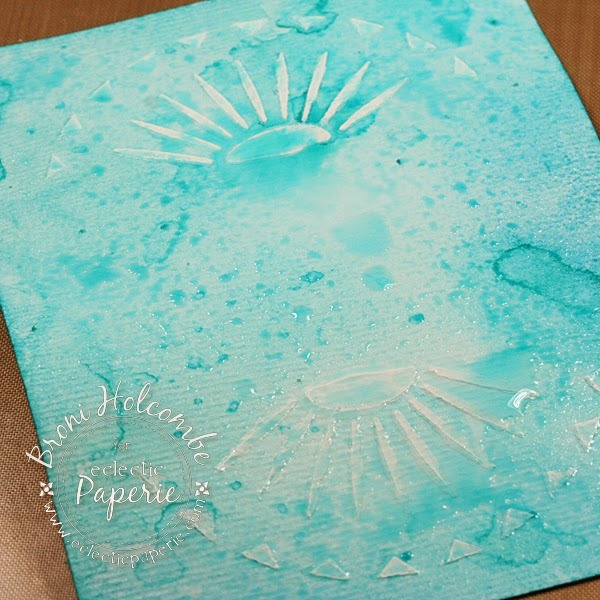 It was added to a white card base using foam mounting tape. Thanks so much for stopping in to visit! I hope you have a very inky day, and we all hope you'll try to play along with us in this month's ePlay challenge - WOOD! Ranger - Watercolor Paper 8.5"x11"
Love the watercolor look on this Broni - and the wonderful touches of gold - it's a great accent for the blues you used! 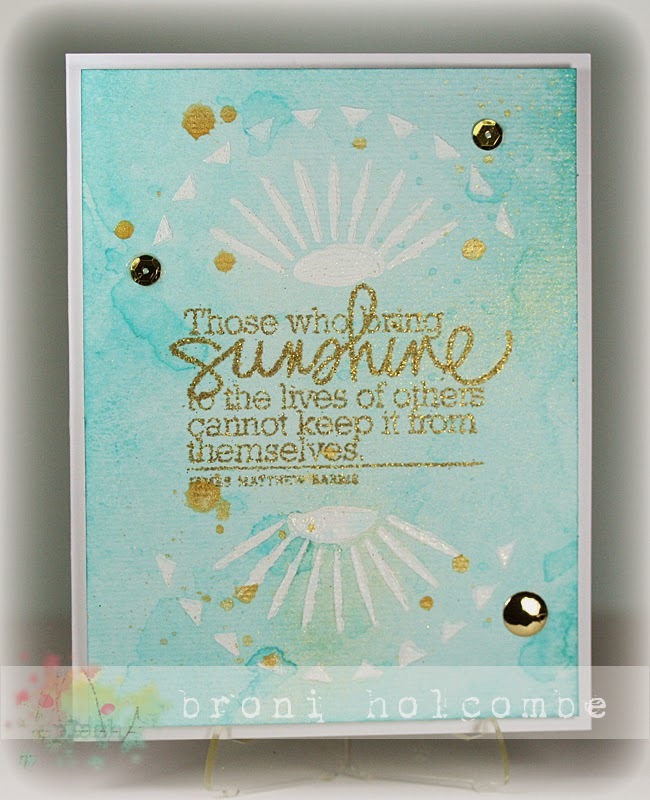 Oh my Broni, adore your soft toned card and beautiful sentiment with the gold!! 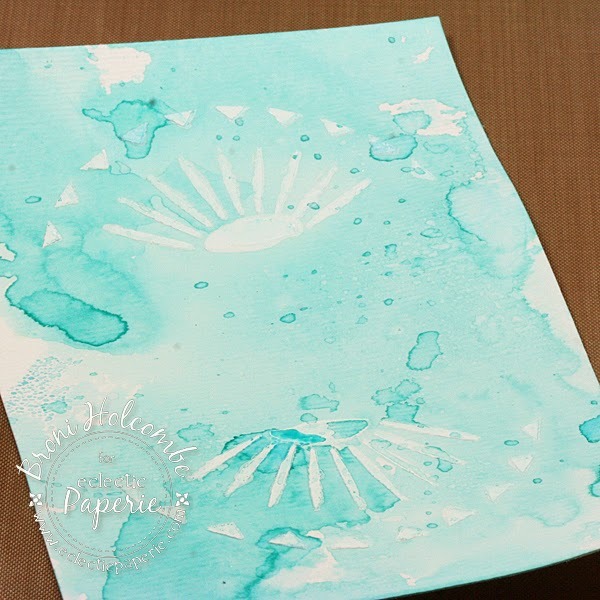 My fave watercolor technique right here girl...but the color combo blew me away. Never would have thought of gold and teal blue! Looks mahvelous! !